The Pacific Northwest National Scenic Trail, often referred to by the acronym PNT, was officially designated by Congress in 2009. The newest of the national scenic trails in the United States, the PNT runs for 1,200 miles along the border with Canada. It intersects with the northern termini of both the Pacific Crest Trail (PCT) and Continental Divide Trail (CDT) along it's route from Glacier National Park to Cape Alava, Washington, the westernmost tip of the lower 48 states. The trail was first proposed and pioneered in the 1970s by Ron Strickland, founder of the Pacific Northwest Trail Association (PNTA). Over the years, Strickland and other trail advocated refined the route and built support for an official designation. The trail starts in Glacier National Park and traverses North Cascades National Park and Olympic National Park on its way. It also crosses through seven national forests that cover much of the route through Montana, Idaho, and Washington. Most hikers choose to start in Montana in early summer and make their way west to avoid the risk of late summer snowfall in the Rocky Mountains. But there is no official direction, and other thru-hikers opt for the west to east route. PNT Overview Map from the U.S. Forest Service. Click on the map to download a high-resolution pdf. The PNT is overseen by the U.S. Forest Service in partnership with rangers at the three national parks it passes through. The trail's official route is approved by Congress, and it is still currently a work in progress. Many sections include alternate routes, and the more popular of these are included with notes in the maps featured in the section guides of the trail found below. The trail also passes through small towns along its course. These trail towns are where thru-hikers can resupply and spend some time relaxing with the welcoming locals who live in the northernmost stretches of the Pacific Northwest. One element that makes the PNT different than other trails that share the national scenic trail designation is the fact that many miles are spent on Forest Service roads and at times on paved highways. In the Puget Sound, the route even requires a ferry ride to the Olympic Peninsula. This should be taken into consideration by potential thru-hikers. With that caveat, most people who have finished the trail find that the road travel is not a huge detractor, and many of the Forest Service road sections function more like widened trails through national forest land. The area is remote, and unlike the PCT or Appalachian Trail, chances are you will go days without seeing more than a few people crossing your path when outside of the national parks or away from population centers. There are many great resources for thru-hikers wishing to take on the PNT. The PNTA serves as a main information hub for hikers and compiles critical trail alerts, hiking guides and references, and a lot more. The PNTA's headquarters, in Sedro-Woolley, Washington, is a popular stop-over spot for thru-hikers on their way to Anacortes and the Puget Sound. Very thorough planning is required in advance if you wish to do the full PNT. Certain sections require advance permits that can be coordinated with National Park Service staff. Equipment such as a bear canister is required along some parts of the trail and highly recommended for others. Food resupplies must be shipped in advance to certain points where the trail goes for hundreds of miles between trail towns with grocery stores and other services. Many hikers also choose to ship new shoes and clothing to resupply points because day after day of trail travel tends to wear them out. Completing the PNT takes between 60 to 90 days for most thru-hikers. That's an average, including any zero days (what thru-hikers call rest days), of 15-20 miles per day, a healthy dose of walking but not an unbearable daily mileage. Temperature and weather conditions will vary dramatically based on the season and, from one day to the next weather can quickly change from sun to rain and thunderstorms, hail, or even some snow. The PNT starts in Glacier National Park at the northern terminus of the Continental Divide Trail. It then enters the Flathead National Forest and Kootenai National Forest before leaving Montana and entering northern Idaho. The long section through Idaho and Eastern Washington weaves through the Kaniksu and Colville National Forests and passes through the Selkirk Mountains and though farm country. In Central Washington the trail returns to forest and glaciated mountains, passing though the remote Pasayten Wilderness and North Cascades National Park, where it intersects with the Pacific Crest Trail near it's northern terminus. From the North Cascades the PNT makes its way to Puget Sound and, with a ferry ride, crosses to the Olympic Peninsula. 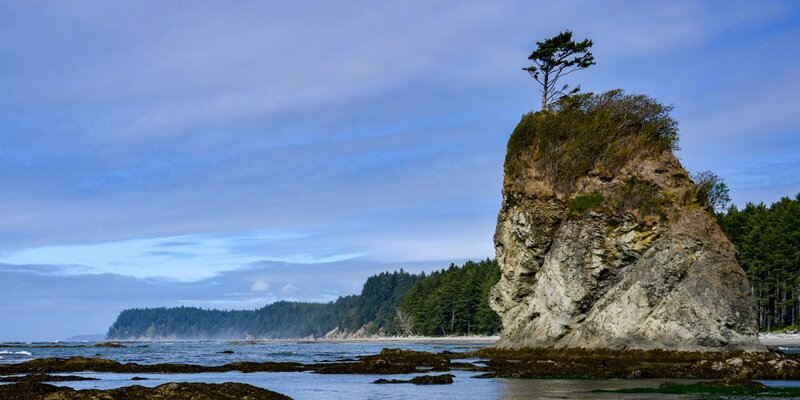 The remainder of the journey goes though Olympic National Park before reaching the ocean and proceeding north along the coast to Cape Alava, the westernmost point of the continental United States. The guides linked to below break the trail into 15 segments running from east to west, each oriented with a starting and ending trail town. Each segment also includes an overview, photos, a map, and information on the trail towns that bookend the segment's the start and finish. These segments vary in length from around 50 to 150 miles, and each can be done in a multi-day journey with car shuttles between the starting and finishing town. For thru-hikers wishing to complete the full 1,200 mile route, our goal in these guides is to give you sufficient inspiration to take on the whole trail and help you identify additional resources you would want to consult and use to do the entire journey. The first 55 miles of the trail transit through Glacier National Park. The trail starts off with incredible scenery, wildlife viewing, high passes and picturesque mountain lakes. Polebridge, just outside of the park, is a welcoming town with a famous saloon and mercantile. The trail makes its way for 74 miles from Polebridge through the Flathead and Kootenai national forests along the border with Canada. The national park may be left behind, but the scenery remains spectacular. 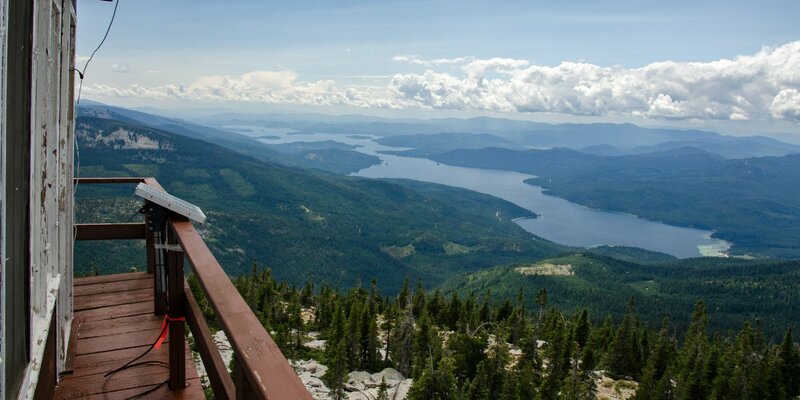 The trail passes by numerous mountain lakes and some fire lookouts with incredible views. The next major resupply point from Eureka is in Bonners Ferry, Idaho. Yaak, 48 miles of trail and road from Eureka, is a great little stopover. To get there, the trail continues though the Kootenai National Forest and crosses over the scenic Koocanusa Bridge. Getting to Yaak requires a short walk or hitchhike off of the main trail, but you can pick up some refreshments in the town's mercantile and have a great time dancing with the locals at the Dirty Shame Saloon once you arrive. A waterfall along the trail in Glacier National Park. Photo by Michael Sawiel. After Yaak, the PNT enters into Northern Idaho and the Kaniksu National Forest. On the 62 miles between Yaak and the jumping off point to Bonners Ferry, the trail goes through rolling hills and through dense fir forests, most of it on Forest Service roads. Reaching Bonners Ferry requires a 22-mile hitch, but this is one of the PNT's critical resupply towns with modern stores, brew pubs and many places to stay the night. The trail to Metaline Falls goes through the scenic Selkirk Mountains on the border with Canada. The views are incredible, and it makes up for the occasionally lengthy road walking and the notably long, hard bushwhack that also makes this one of the hardest sections of the PNT. On this section the trail crosses into Washington State. Metaline Falls is a small town, and its post office serves as a good resupply point to send shipments of clothes, shoes and food. This is homestead country, and in this section the trail passes by many small farms and old, abandoned farm plots in and around Colville National Forest. From Metaline Falls to Northport it's only 42 miles, the shortest segment of the PNT between resupply trail towns. Northport is a relatively small town on the banks of the Columbia River, and it lies directly on the PNT route. Lower Priest Lake from the fire lookout atop Lookout Mountain in the Selkirk Mountains. Photo by Michael Sawiel. This 99-mile section goes along the Kettle Crest Trail and combines miles of Forest Service roads and trails in a very remote section of Eastern Washington. A major wildfire closed sections of the PNT in 2015, and it will remain rerouted at least through 2016 while the Forest Service rebuilds the trail. Reaching Republic, a charming old mining town, requires a short hitch. It's another 100 miles of road and trail to reach Oroville from Republic. At times the trail runs along paved roads in farm country, but for most of this section it is in the Okanogan National Forest. The PNT goes directly through Oroville, a good sized town with many resupply options and places to recharge. The next trail town isn't for a few hundred miles. After days walking through Eastern Washington's farm country, the trail returns to forests and mountain lakes in the Pasayten Wilderness with a remote and incredibly scenic 150 mile journey to Ross Lake. Many thru-hikers consider this section to be one of the highlights of the 1,200 route. Ross Lake is little more than a resupply spot before entering North Cascades National Park. While Ross Lake Resort has served as an ideal place to ship packages for the next stage of the journey, this may change to another location soon, and hikers should confirm resupply options in this section with the PNTA moving forward. Wilflowers and mountain views in the Pasayten Wilderness. Photo by Michael Sawiel. Leaving Ross Lake, the next few days go along large old-growth forests and glaciated mountain passes in North Cascades National Park before skirting Baker Lake at the foot of Mount Baker. Reaching Concrete, a good resupply and rest town at the gateway to Mount Baker Wilderness, requires a short hitch to avoid a tiring road walk into town. There are a few different trail options to go from Concrete to Anacortes, including a rail-to-trails line that takes you into Sedro-Woolley and the PNTA's headquarters, where thru-hikers are always welcome to drop in. The official route is mostly on Forest Service roads. Anacortes is a city in the Puget Sound with lots of amenities. Camping in this section can be a challenge, and this is one of the heavier road-walking segments of the PNT. Port Townsend, at the northeastern tip of the Olympic Peninsula, is a short 47 miles from Anacortes, and to reach it requires a ferry ride. The trail through the Puget Sound is mostly spent on the shorelines of Whidbey Island with camping in the state parks passed along the way. Resupplying means stopping at the various stores passed on the island and hikers can opt to stay in one of the many B&Bs on the island as well. Port Townsend is an ideal town for resupplying before continuing into Olympic National Park. Pacific Ocean views along the Olympic Coast. Photo by Michael Sawiel. Once on the Olympic Peninsula, the PNT enters Olympic National Park for much of the remainder of its route. This first section goes through dramatic mountain passes and past Hurricane Ridge, the most popular visitor center and viewpoint in the park. From the banks of the Elwha River, Port Angeles is a short and easy hitchhike away. The PNT continues through Olympic National Park for another 58 miles to the town of Forks. This section of national park is called the High Divide for a reason, with dramatic views, mountain lakes, amazing wildlife, and a final push through the temperate rainforest for which the park is most famous. Forks has a post office and outfitter to resupply and pick up tide charts for the final leg of the PNT along the Pacific Coast. The final 57 miles of the PNT is mostly spent along the shores of the Pacific. Here, tide charts are critical; some areas are only passable at low tide. Campsites dot the shoreline, encompassed by the coastal sliver of Olympic National Park. Fishermen often provide a ferry across the Quillayute River at La Push for a small fee. Reaching the end of the trail at Cape Alava is a bittersweet end to an amazing yet challenging 1,200-mile journey on the Pacific Northwest National Scenic Trail. Backcountry camping permits are required in the three national parks that will include designated campsites for each night of your visit and a trip through the park. Getting the right permit can be a competitive process, but the National Park Service makes certain exceptions for thru-hikers to help with the challenges of coordinating a hike of this length and difficulty. Thru-hikers should contact rangers at each national park before starting the trip and then coordinate with them again once they arrive. North Cascades National Parks maintains an information page for PNT thru-hikers with more on how to arrange permits and coordinate with the park before your visit. Keep in mind that rules are subject to change over time. The PNTA also maintains a list of Forest Service and National Park Service agencies to contact for more information when planning your thru-hike. Thru-hikers should also make sure to carry a valid passport or another form of identification proving United States citizenship when hiking the PNT. In many areas the trail skirts within a few miles of the U.S. and Canadian border. Border patrol agents are present in many areas that the PNT passes through and will certainly check hikers with backpacks that they encounter along their patrols. Be especially prepared in sections of the trail around Eureka, Montana, and Metaline Falls, Washington. Proper food storage in bear canisters and/or bear boxes is required throughout sections of the trail that are in national parks. While bear boxes exist at some designated backcountry campsites along the trail, most campsites don't have them. Therefore, bear canisters must be carried and used to store food. In other sections of the trail where bears and other animals are present, although bear canisters may not be required, they are highly recommended. PNT hikers can rent bear canisters from ranger stations and wilderness permit offices, but given the length of the PNT, many hikers will opt to purchase one. The National Park Service maintains a list of approved bear canisters for Glacier, North Cascades and Olympic national parks. 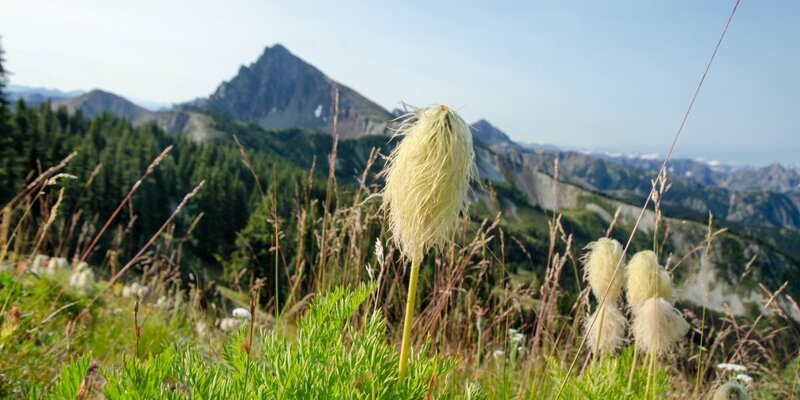 Note that Ursacks, a commonly used alternative to hard bear canisters that are loved for their portability and light weight, are not approved for use in Olympic National Park, and they are not as resistant to smaller mammals such as marmots, fishers and even raccoons. Hitchhiking is common on parts of the PNT, and at times it is a real necessity. Trail towns can be many miles away from where the PNT intersects with a highway. While some thru-hikers will opt to walk those roads, many prefer to hitch a ride to and from the town. While in most areas flagging a hitch is easy, there are many remote areas where it may be a long wait before someone will offer you a ride. There are a few highways with fast traffic and narrow shoulders where walking along the road could be unsafe. We have attempted to provide information on the section maps where walking alongside the road is not recommended, but everyone must make their own safety determination. At the same time, hitchhiking poses a similar risk in terms of catching a ride with a stranger. Again, hikers are recommended to use caution when deciding to accept a ride when offered. Road walking is also commonplace on the PNT. Many sections of the trail are on Forest Service roads, some of which are still in use, albeit lightly trafficked. Other sections may require miles of walking on the shoulder of paved roads and highways in areas referred to as zones of connection. The Forest Service has made a significant effort to maintain a trail and unpaved road experience for the length of the PNT, but there are areas where road travel cannot be avoided. While some thru-hikers may decide not to take on the challenge of the PNT due to this reality, those who have usually come to enjoy the varied surfaces of travel as well as the opportunity to journey through a route that combines a mix of wilderness, ranching, urban environments, and the varied perspectives this brings to the experience. The Pacific Northwest Trail Association (PNTA) serves as the main conduit of information and resources for people looking to thru-hike the PNT. Updates and trail reports are likely to be posted with the PNTA first, so it is the best place to check for up-to-date information. They maintain a page on How to Prepare for a PNT thru-hike with links to the PNT Hikers Group on Facebook as well as the PNTA Forum for ongoing issues and important topics discussed by thru-hikers. Thru-hikers will also need a good guidebook with mile-by-mile route guidance and all the details needed to successfully complete the 1,200-mile route. While there are many good guidebooks available, the PNTA recommends the Pacific Northwest Trail Digest by Tim Youngbluth as the best bet. 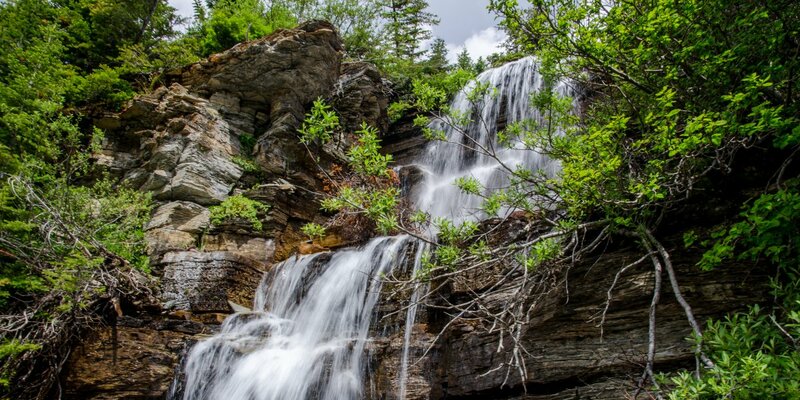 For those of you who opt to take on the challenge of the PNT, keep in mind that this trail is, in the words of the PNTA, "one of the most beautiful, rugged, remote and exciting opportunities in the National Scenic Trail System. It's also one of the most physically and mentally demanding, and while the Pacific Northwest Trail outshines many trails in wild grandeur and adventure, it lacks a development community and many amenities of the more established trails." Some people recommend thru-hikers take on a more popular long-distance trail first, but as a first time thru-hiker I can say that with the right skills and physical preparation, the PNT was an amazing journey and provided, in one summer, a lifetime of memories. 1,200 mile national scenic trail. Trail traverses three national parks. Unique perspective of Northwestern United States. Trail towns. Significant sections of road walking. Hitchhiking to resupplies. Few amenities for newest National Scenic Trail. Thanks for your question, Heidi. Currently the number doesn't refer to total elevation gain; "net" is the difference between the highest and lowest points on the route. As for total elevation, you are correct...the number would be much greater.